When choosing a vacation destination, one of the top questions that enters any traveler’s mind is ‘How are the beaches?’ The beach is the symbol of getting away from regular life; it’s a relaxing, welcoming place where people go to simply kick back and have fun, forgetting their worries and living life to the fullest. Beaches have so much to offer, providing beautiful views and the perfect setting for long, lazy days of lying around soaking up the sun or enjoying a good book. They’re also excellent places for outdoor enthusiasts who like to stay active, with swimming, surfing, jet skiing, wakeboarding, snorkeling, scuba diving, and other great activities all being possible at the beach. Of all the prime beach destinations on the planet, Hawaii really stands out. The Aloha State, made up of many different islands, has an exceptionally long coastline and an almost never-ending list of breathtaking beaches for everyone to enjoy. No matter where you happen to be in Hawaii, you’re never too far away from the sort of beach that will make your jaw drop and give you magical memories to last a lifetime. The Kona region of Hawaii’s Big Island is an especially popular place for beach-goers of all kinds, and there are a lot of lovely shoreline spots to appreciate and admire around Kona. If you’re heading to the Kona region on the west coast of Hawaii’s Big Island, you’ve got some big decisions to make. Choosing which beach to visit can actually be quite difficult as there are simply so many beautiful spots in the area, but hopefully the information below will be able to help you. We’ve taken a look at Kona’s beaches and highlighted some of the very best spots in the region, noting the various amenities and activities you can enjoy at each location. Read on to learn more. 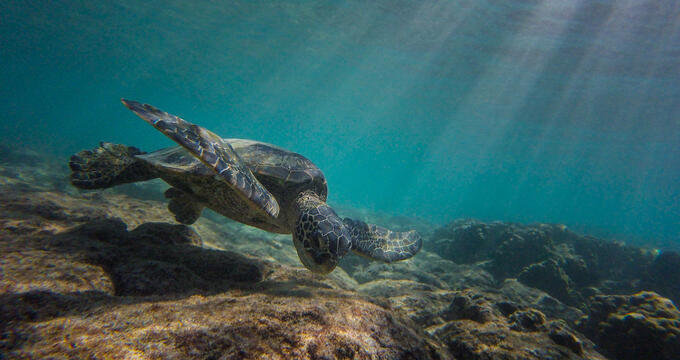 For nature and animal lovers in the Kona area of Hawaii, Kuki'o Beach is a must-visit location. This beach is popular with people, but it's also beloved by another species: sea turtles. Lots of turtles like to swim around this area and can be spotted coming ashore from time to time too. Of course, visitors are discouraged from getting too close to these animals, but they're stunning to observe from a distance. The silky smooth sands of Kuki'o Beach also make this beach a super spot for relaxing or walking along the shore. Located in downtown Kona, King Kam Beach is a very small but pretty little beach located right by the Kamakahonu National Historic Landmark. The beach, which is also known under the name Kamakahonu Beach, is a super spot for snorkeling and swimming as the surrounding land helps to protect the area, keeping the waters very calm and gentle at all times of year. This Kona beach is also situated right by Kona Pier, which is a very popular gathering point for tourists and locals alike. Fishermen can almost always be found here and there are various charters and fishing rental locations found nearby. In addition, this is a super Kona Beach to observe the sunset, with the sky being illuminated in various reds and oranges every evening and providing a stunning background for some memorable holiday photos. This beautiful bay is divided up into both public and private areas, so you need to be careful about where you go, but the public spots are signposted and it's not too difficult to figure out. Visiting this beach when the tide is low is a great idea, as lots of little tide pools are formed, perfect for exploration and adventures with little ones. Snorkeling and swimming are also popular at this beach and it's a super spot to simply lie back and feel the warmth of the sun washing over you. Just don't forget to bring some sunscreen as there aren't too many shady spots at Kiholo Bay. Definitely one of the most popular beaches on the entire Big Island and especially in the Kona area, Kahalu'u Beach Park is an extensive area with a lot of great amenities. Rental stalls offer beach equipment at low rates, the local snack bar can keep your energy levels up, and there are plenty of seating areas too. This long, open beach benefits from the presence of a reef not too far off the shore, which helps to keep the waves relatively small and calm. It's a great place to do some snorkeling and swimming, but it's important to note that due to Kahalu'u's beauty and amenities, it can get very crowded at certain times of year, so do your best to arrive early or be prepared to walk around a little in order to find a good spot on the sand. There isn't much sand at Kika'ua Point Beach. It's more of a long lagoon with gently sloping banks where visitors can sit and admire the water before diving right in. It's a lovely spot for families to visit as the waters are very warm and exceptionally calm. You probably won't see a single wave at this location, so it's a great Kona beach for families to paddle around in the waters and admire the beauty of the surrounding scenery without any worries or danger. If you have younger children, this is definitely a must-visit spot.